Standardized Telephone Number formats work even on old phones! There are many different address books and directories online, and there are almost just as many different ways they store telephone numbers. I guess most people don’t realize that there are actually standards for representing phone numbers. A little bit of standardization would go a long way towards interoperability. The standard for phone number formatting is set by the International Telecommunication Union in [E.123] and [E.164] (see the references below). The standards documents are available for a fee from the ITU [available at no charge since 2010 –Bob.] . A summary is available in the Google (UseNet) discussion group, titled Need ITU-T E.123 summary. “;ext=” optionally identifies the next portion as an extension and “xxxx” are the digits for that extension. This syntax is usable in URIs and e-mail. Note that the sequence “AAA-PPP-NNNN” is called a “local number” and “+C-AAA-PPP-NNNN” is called a “global number”. The “-” (hyphen) is a visual separator, as are “.” (period) , “(” (left bracket) and “)” (right bracket), which dialing applications should ignore. I’m mostly interested in making phone number formats in e-mail addressbooks compliant with e-mail standards. The document that covers this is the IETF’s [RFC3191], "Minimal GSTN address format in Internet Mail" . The requirement is that GSTN (Global Switched Telephone Network) numbers use the global-number syntax (“+C-AAA-PPP-NNNN”). Global Numbers Globally unique numbers are identified by the leading “+” character. Global numbers MUST be composed with the country (CC) and national (NSN) numbers as specified in E.123 [E.123] and E.164 [E.164]. Globally unique numbers are unambiguous everywhere in the world and SHOULD be used. Local Numbers Local numbers are unique only within a certain geographical area or a certain part of the telephone network, e.g., a private branch exchange (PBX), a state or province, a particular local exchange carrier, or a particular country. URIs with local phone numbers should only appear in environments where all local entities can successfully set up the call by passing the number to the dialling software. Digits needed for accessing an outside line, for example, are not included in local numbers. Local numbers SHOULD NOT be used unless there is no way to represent the number as a global number. Local numbers SHOULD NOT be used for several reasons. Local numbers require that the originator and recipient are configured appropriately so that they can insert and recognize the correct context descriptors. Since there is no algorithm to pick the same descriptor independently, labelling numbers with their context increases the chances of misconfiguration so that valid identifiers are rejected by mistake. The algorithm to select descriptors was chosen so that accidental collisions would be rare, but they cannot be ruled out. If you work at a company that does work with organizations and staff members outside of the context of your area code (ie. internationally) be sure to standardize your directory on global-number syntax. for National and International Telephone Numbers. 1993. Public Telecommunication Numbering Plan. 1997. 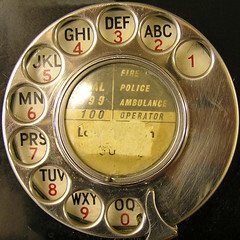 Image: Telephone Dial by Leo Reynolds, used under Creative Commons v2.0 BY-NC-SA.